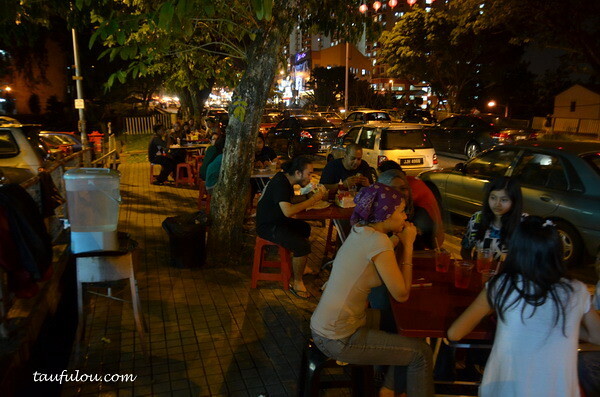 Many of us know Ramlee Burger is a little stall that operate by road side or in neighborhood area to cater small little demand around the place and not many burger stall actually are good and to hunt for really nice one, is just a few. 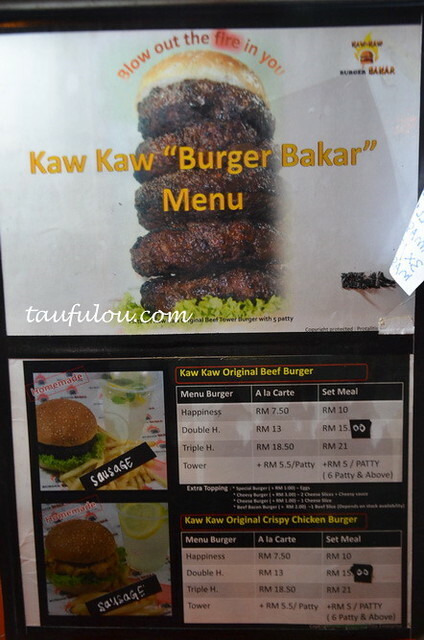 Kaw Kaw Burger Bakar is taking the lead for burger evolve. 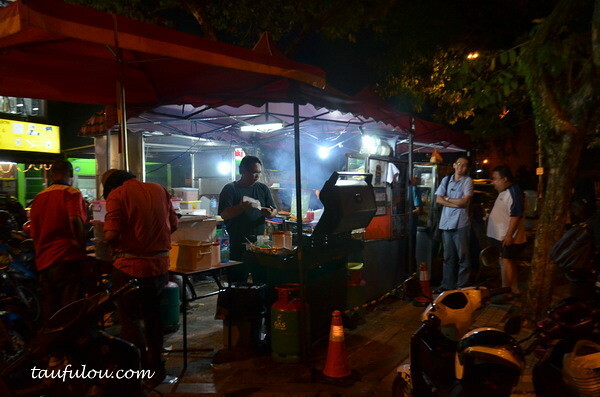 Its a burger stall that located in Wangsa Maju whereby at the stretch of famous mamak stall to Tarc students BRJ with big yellow sign board and the burger stall is located directly the other end of the shop house or consider in front of this shops. 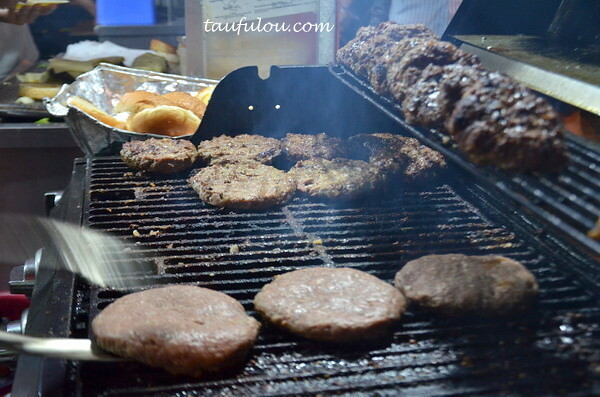 This is no ordinary burger stall as they operate quite a huge place and you can see a huge bbq pit sitting there grilling many pieces of burger patties none stop, and there is a little queue. So we just follow what others do. . .
and they do offer place for you to dine as you have to wait for other people to finish theirs then you will get your place. They actually also have hall of fame on how many patties of burger you can take. On another picture, there is a slim guy that ate , I think 11 patties.. that is seriously OMG! with 180g per pastie. Try to imagine that. Price wise is very reasonable as a set that comes with extra 2 sausages and 1 drink cost only RM 10. 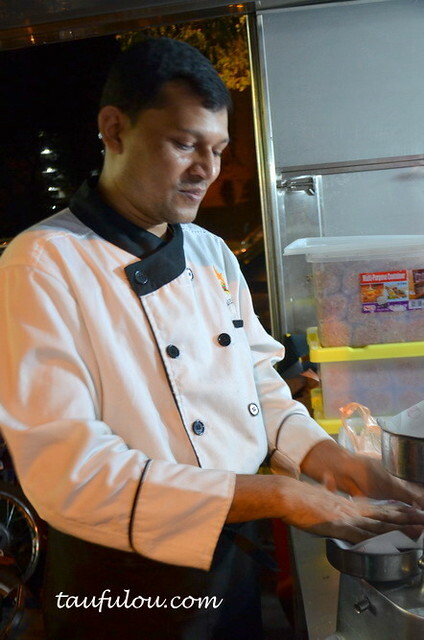 The chef preparing the pattie. 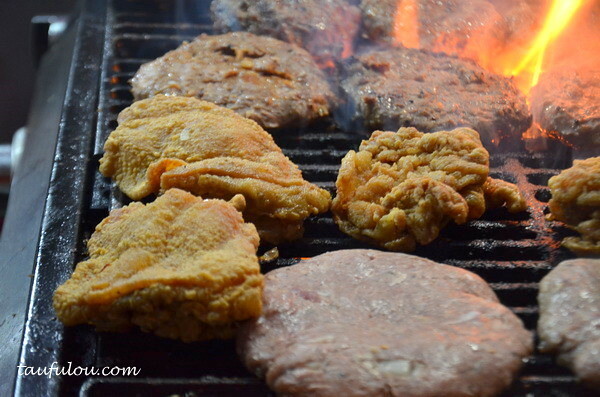 So they place the pattie on this hot pit and grill it. .
2 versions of meat on the pit, KFC style fried chicken that act as Chicken burger ..
and this is the beef patties waiting to be park along with the bread. 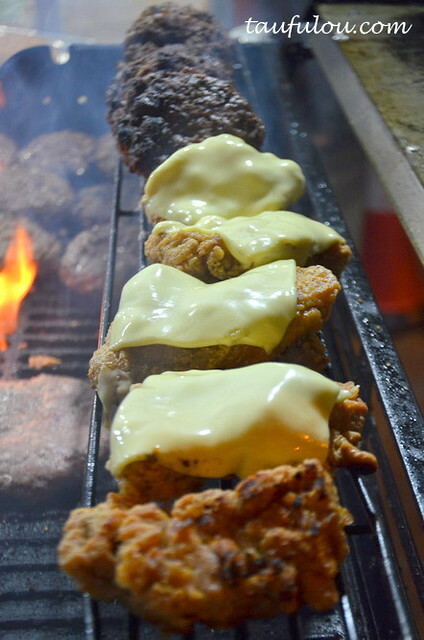 the chicken version with a slice of cheese sitting on top and slowly melting off. 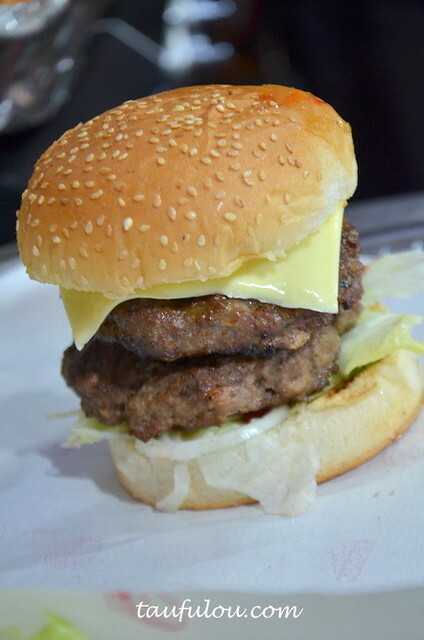 A burger that is quite moist and not dry ..
How can I not have my burger without a cheese, as its always a must for me. 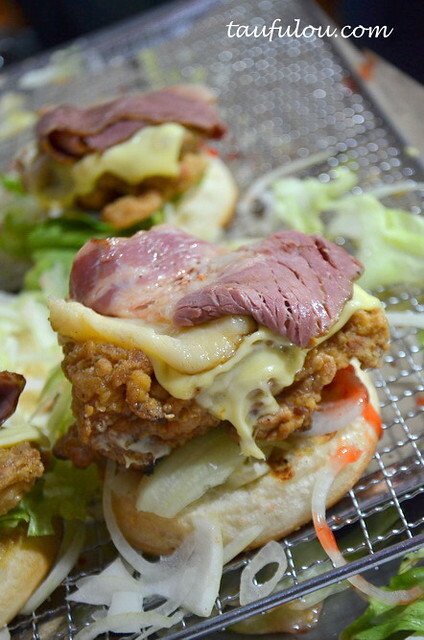 This is what Ken had, triple stack which is crazy. Too huge and lots of meat to consume with every piece is 180g, so 3 pieces about half kg meat already. 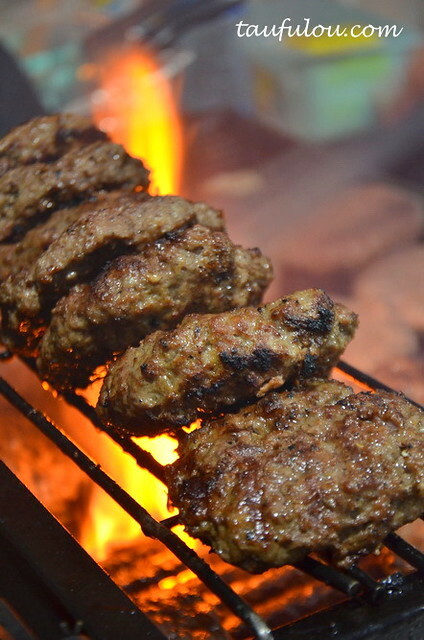 The meat was grill till moist and not too dry inside. On that day we had, there are quite alot of veins in the meat, so there are a few small pieces need to take out. 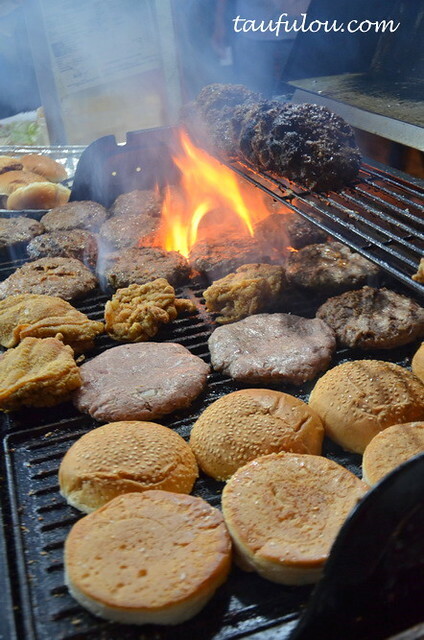 As for me one normal set with bacon on top is good enough for me and according to Ken, after the 3rd pieces he felt like eating oil already which I agree with the way they grill it. Advise is just go for single set and if you are a big eater double is good enough. Well, if you want to eat something unique compare with other Ramlee stalls, this is one of the stall I would be Recommending because of homemade style. 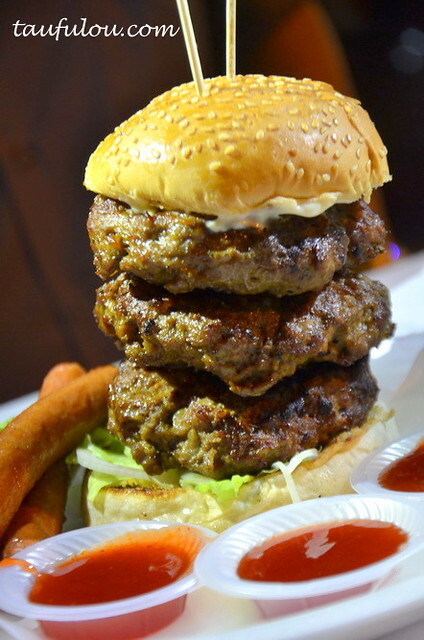 Seriously KAO KAO burger… Three patties in a row.. Damn heavy portion for me…. heee..glad that you enjoy it.. Superb! The taste is great, but I think they can improve more on the cleanliness. 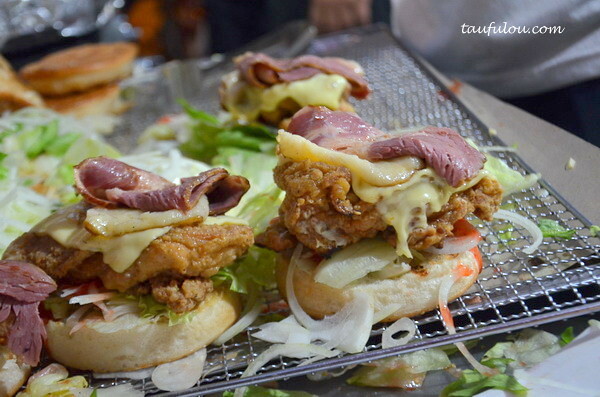 Can also try HK Grilled Burger at Wangsa Melawati, or MR Junior at Kelana Jaya. Search them out. sure..will check it out on your recommendation.. I was there just now.. at 9pm Tuesday 20/3/2012..
All the way from Putrajaya.. I have no idea, one of the reader told me that they close on monday. now u mention tuesday? hmmm. .. . i guess you shall call in next round to check with them . .
Kindly be informed that Wangsa Maju Seksyen 2 is going to be closed today due to maintenance. Most probably we will open as usual tomorrow. Thank you. Untuk makluman anda, Wangsa Maju Seksyen 2 tidak akan beroperasi untuk hari ini oleh sebab kerja kerja penyelenggaraan. 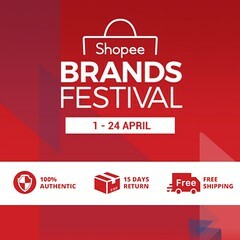 Kemungkinan hari esok kami akan beroperasi seperti biasa. Terima kasih. 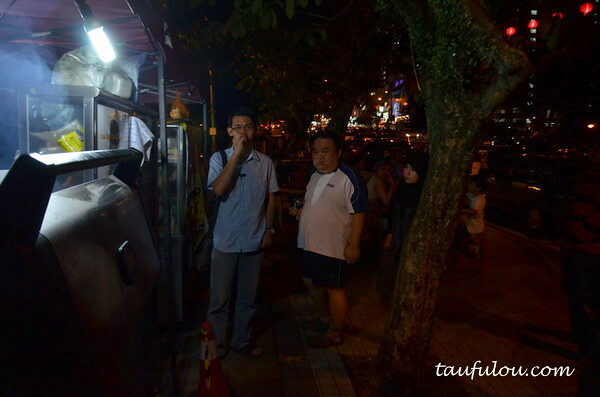 for sure i will try it someday.. looks delicious.. nyums..
i went there yesterday. Q @ 6.15pm, start ordering @7.30pm and I got my patty @7.58pm. Impressive!!!!!!! They improved a lot! And the patty tastes soooo goooooooooooood! oh yeah, my number is 28 when they took the order. 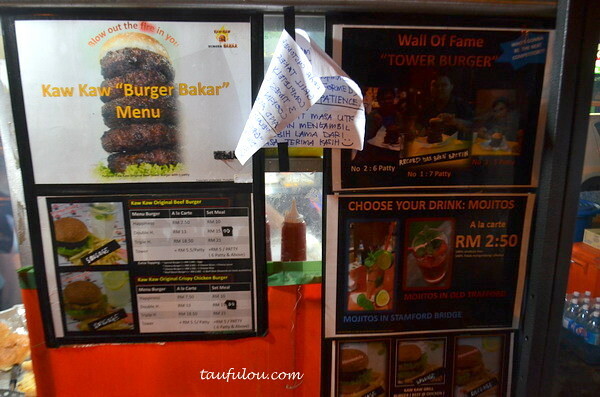 Another two burger bakar industry.. Rawang Burger Bakar and KL Burger Bakar. 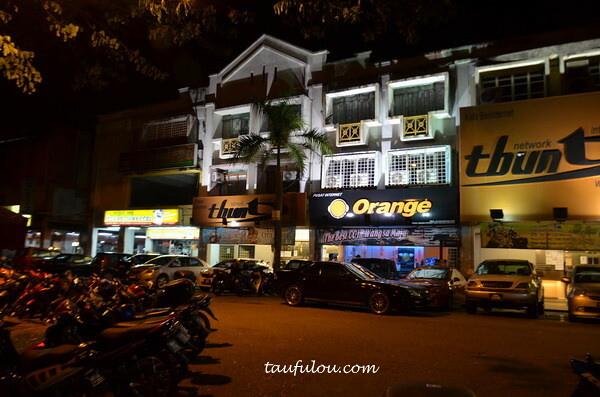 Both can find at Wangsa Maju. 2 hari lepas baru jer pegi seksyen 2 wangsa maju..then ingat nak makan burger bakar lagi wat kali yang ke 7..pastu time wat u-turn dekat sekolah tu ternampak 1 stall yang biasa la but ramai gak org kat c2..then try to find out apa dorang wat..ingat kan burger bakar jugak but…salah tapsiran beb..sekali lagi benda baru..wah HOT DOG MANIA nama kedai dia..style beb..mmg dijamin puas hati and kenyang dan berbaloi2…coz price xdela mahal…then sauce yg dorang home made 2 mmg gempak…should try..
kalau sekali tgk style dorang cam 1901…tapi nie lagi berbaloi…xtau nak ckp..dtg,makan,baru tau..
yang makan ri2 nama dia chilli DOgz…fuhh terbaik..cuba try…xrugi..